If you have a chipped, cracked, or broken tooth, you likely need a dental crown to seal it and cover it up. Not only does a dental crown in Costa Mesa protect the inner layers of your tooth from cavity-causing bacteria, but it also can restore your tooth’s full health, strength, and function. But maybe you’ve heard about some bad experiences with dental crowns. They can come loose, crack, or let decay access your tooth underneath. So what determines how long a dental crown stays effective and lasts? How can you increase the lifetime of your dental crown? Get the answers to your questions with this post. Your dental history. For example, if you’re prone to cavities, your crown may not last as long. Your dentist will be able to give you a more accurate estimate timeline based on your dental history. Proper fit. Make sure that your dental crown fits from the beginning. If your dentist works with a trusted, high-quality dental lab, your crown will be more likely to fit comfortably in place. Oral hygiene. Healthy oral practices are vital to preserve your dental crown in the long run. These practices can help prevent bacteria from loosening the crown and accessing your tooth underneath it. If you take excellent care of your dental crown, you can increase its lifespan significantly. Oral habits. You can cause damage to your dental crown through oral habits such as chewing on ice, chewing on pencils, or grinding or clenching your teeth. Brushing at least twice every day. Visiting your dentist in Costa Mesa twice a year for checkups and cleanings. Using an antimicrobial mouthwash daily. You may be tempted to wait to get a new dental crown, but you really shouldn’t. Your chipped, cracked, or broken tooth can have openings that allow bacteria to contact and infect the more sensitive pulp center of the tooth, which can cause you severe pain. 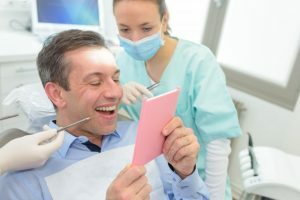 By acting immediately and having the tooth sealed and topped with a dental crown, you help strengthen and protect your natural tooth for the long haul. In the end, a dental crown is a great way to preserve your natural tooth and regain its health and strength. By weighing all the factors that contribute to your dental crown’s lifespan, you can make any necessary changes in your lifestyle to help make your dental crown last longer. For more information about dental crowns, contact your dentist in Costa Mesa. Dr. Jeremy Jorgenson is an active member of the American Society of Implant & Reconstructive Dentistry and focuses primarily on restorative procedures in his practice. He has also volunteered his services for the underprivileged both at local events and free clinics and in other countries. To contact him for an appointment, you can call (714) 424-9099 or click here.